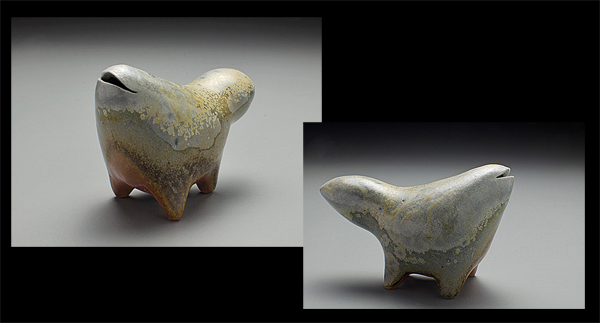 North Star Pottery was begun in 2004 out of the simple pleasure of working with clay. Putting my hands to work creating objects has always given me greatest personal satisfaction. My work tends to be functional and simple. I am educated as an Industrial Designer and currently also working as a Furniture Designer. Values: Every piece is hand made in my rural Missouri studio and made with a spirit of exploration and one of constantly striving to improve my craft. Why: It is the skill, art and chemistry that I find so interesting. It is the process of taking moist clay, forming it, applying glaze and subjecting it to intense heat to create something that has purpose and beauty that inspires me. It is the uncertainty of every time I open my kiln and not knowing what I will see, except that each piece will be different, is what satisfies me. I would do nothing else. 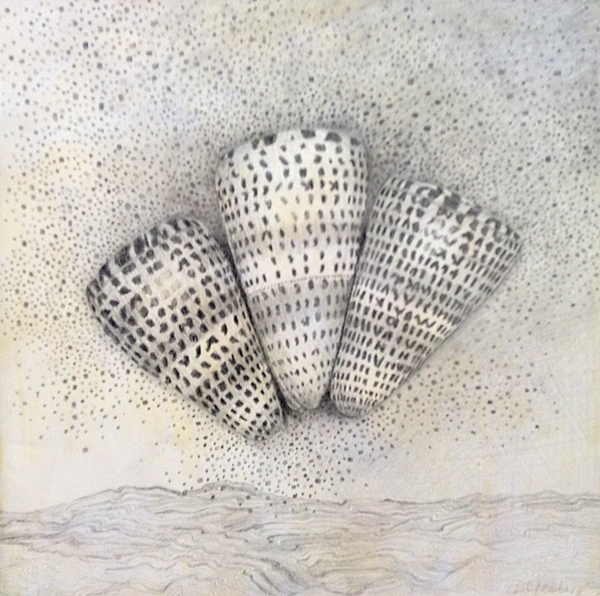 Dream: My Dream would be to have North Star Pottery become more than a busy hobby studio. A studio focused on quality of craft, original glazes and beautiful simple forms. A studio that simply makes good pottery for even better people. 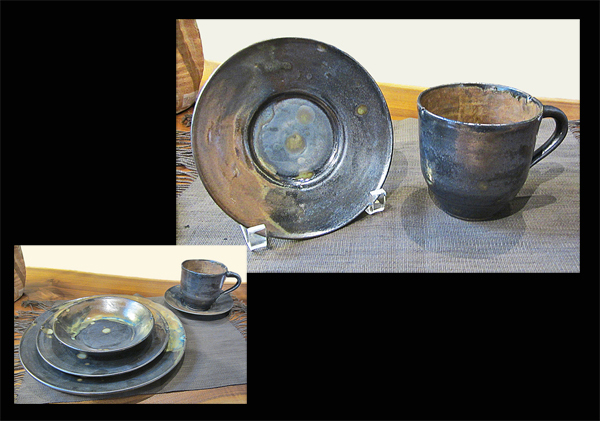 A recent arrival at the Gallery is the artist's new series of dinnerware, dark grey with splashes of turquoise and caramel color. Available individually or as full place settings by special order. This listing is for one bowl only (shown with place setting). Please contact the Gallery for ordering information. 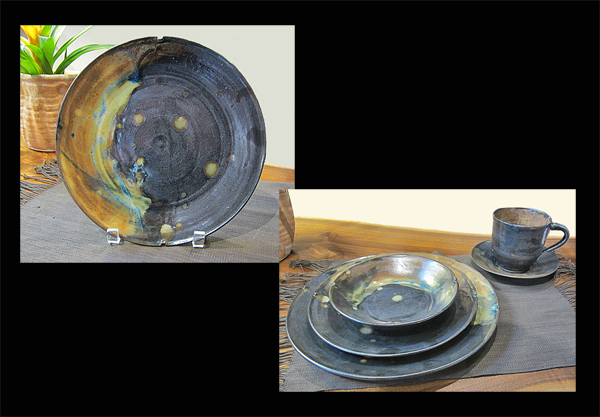 A recent arrival at the Gallery is the artist's new series of dinnerware, dark grey with splashes of turquoise and caramel color. Available individually or as full place settings by special order. This listing is for one dinner plate only (shown with place setting). Please contact the Gallery for ordering information. 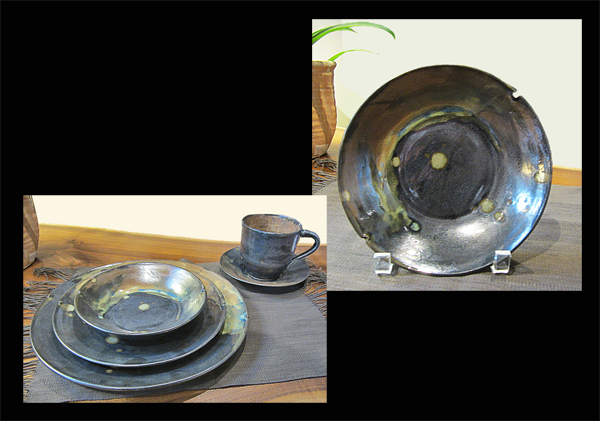 A recent arrival at the Gallery is the artist's new series of dinnerware, dark grey with splashes of turquoise and caramel color. Available individually or as full place settings by special order. This listing is for one place setting. Please contact the Gallery for ordering information. 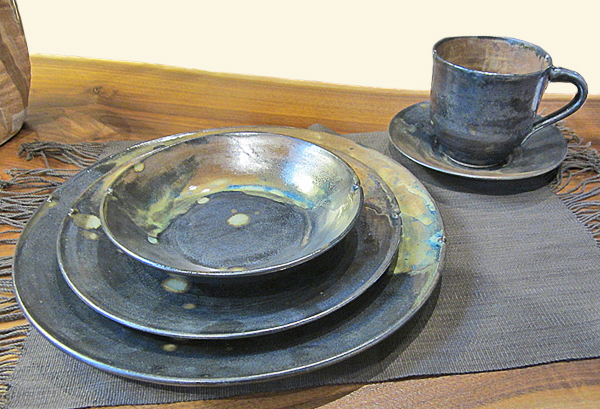 A recent arrival at the Gallery is the artist's new series of dinnerware, dark grey with splashes of turquoise and caramel color. Available individually or as full place settings by special order. This listing is for one salad plate only (shown with place setting). Please contact the Gallery for ordering information. 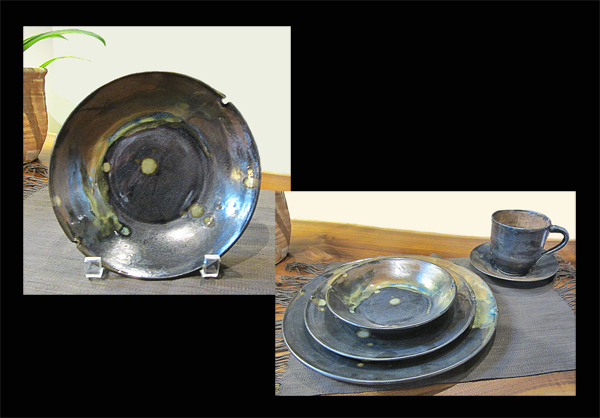 A recent arrival at the Gallery is the artist's new series of dinnerware, dark grey with splashes of turquoise and caramel color. Available individually or as full place settings by special order. This listing is for one cup and saucer only (shown with place setting). Please contact the Gallery for ordering information.